Description: The Zildjian ZBT 3 Cymbal Set is a pre-matched box set which includes 13 inch HiHats, an 18 inch Crash Ride with a brilliant finish and a free 14 inch crash cymbal. The ZBT Rock models add heavier weights and higher-pitched, more cutting cymbals to the line. 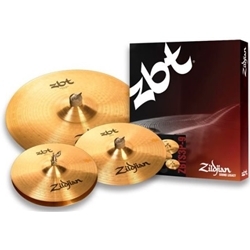 ZBT Rock HiHats offer dynamic power and projection, with a pronounced, bright chick sound. Their timekeeping mate, the ZBT Rock Ride, projects a cleanly defined ping with minimal wash and a clean, cutting bell. The Rock Crashes produce precise punctuation that is at home taking on the most dynamic of music.